On Halloween Eve we will be serving a special 4 course dinner. Chef Adrian and his staff will add an additional course to our normal 3-course dinner so no goblins or ghosts will go hungry while trick or treating. 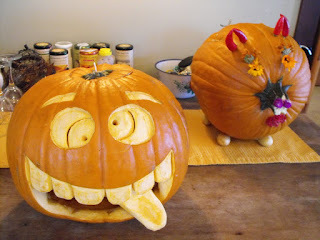 Additionally, guests dining with us on Halloween will also be judging our 3rd annual pumpkin carving contest. The staff take this contest very seriously, especially Don, the assistant innkeeper. I think he got robbed and he should have taken home the blue ribbon.... but unfortunately they don't let cats vote. 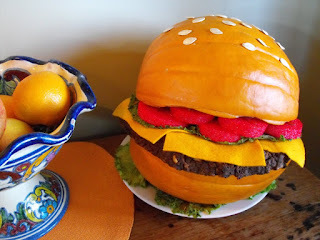 Last year's winning pumpkin was cleverly shaped like a hamburger.